Imagine a garden of miniature llamas, corn, flowers, and people all made of gold and silver. Such a garden existed in the courtyard in one of the most important Inka temples, the Qorikancha, in the capital city of Cusco. One of these beautiful metal objects is a gold-silver alloy corncob sculpture. It mimics the appearance of a ripe ear of corn breaking through its husk, still on the stalk but ready to be harvested. In this sculptural representation of maize (Zea mays), individual kernels of corn protrude from the cob that is nestled in jagged metallic leaves. Inka metalsmiths expertly combined silver and copper to mimic the internal and external components of actual corn. Hollow and delicate, the ears of corn on the stalk are life-sized. While many ancient Andean art traditions favored abstract and geometric forms (such as the All-T’oqapu Tunic), Inka visual expression often incorporated more naturalistic forms in small-scale metal objects. 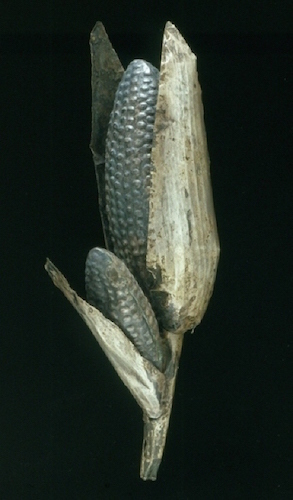 This silver alloy corncob sculpture is one example of this type of object. After the defeat of Inka leadership in the 1530s, Spanish royal agents set up colonies across the continent. They looted Inka objects in large quantities and sent many back to Spain. The silver corncob and stalk were likely part of the spoils captured in this raid. By 1534, the collections of the Spanish king Charles V included a gold maize stalk with three leaves and two ears of corn, similar to the one above. 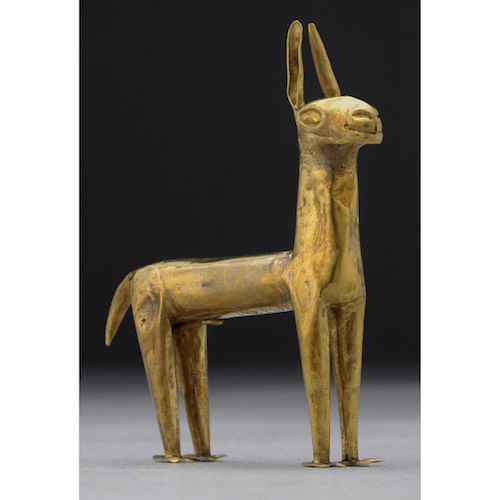 Royal inventories also describe gold and silver llamas, female figures, a lamb, and a male figure that purportedly originated in in one of the most important Inka temples in the capital city of Cusco, the Qorikancha. The life-size garden was a significant offering within the Qorikancha where it became part of a compact version of the cosmos controlled by the Inka state. It also represented the vast range of ecosystems encompassed by the empire and the most important agricultural products cultivated in them. The empire reached from the desert coasts to over 6000 feet above sea level. Plants and animals represented in the golden garden cannot grow and survive at every point in the empire, but only at specified altitudes. For example maize grows up to a mid-range altitude, and llamas graze at the highest points of the empire. The metallic maize cobs would have represented one of the most important imperial foodstuffs, used for making the chicha (maize beer) consumed at political feasts, which cemented the obligations of local political leaders to the Inka state . For centuries, an organized “vertical archipelago” system and terracing technologies allowed Andean people to obtain the foods and materials that they needed to survive from different elevations. The Inka adopted these systems, enhanced them, and exploited them on an imperial scale. 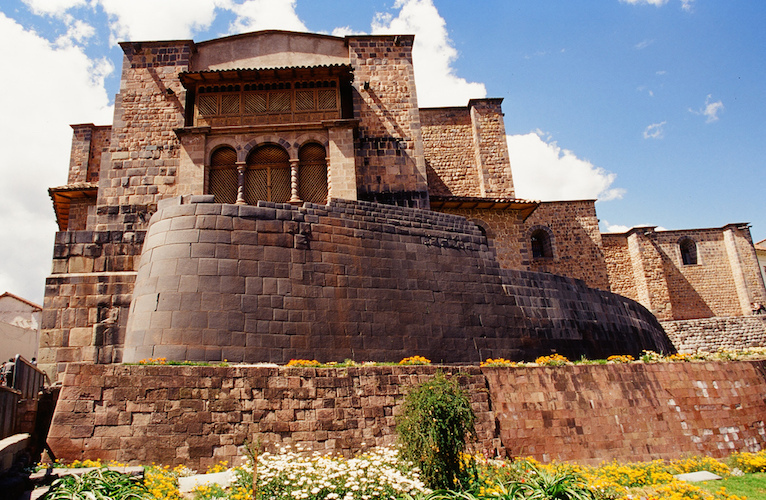 The Qorikancha’s garden asserted the natural world as a possession of the Inka at the same time it reinforced their divine right to rule across the Andes. The Inka commonly deployed small-scale naturalistic metallic offerings, like the silver alloy corncobs, in ritual practices that supported state religion and government. Offerings have been found across Inka territories. 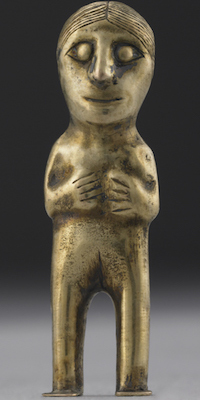 Besides corn, these offerings included small gold and silver human figurines ornamented with textiles that accompanied qhapaq hucha sacrifices at the furthest reaches of the empire. All these offerings acted as symbols of the supernatural origin of the Inkas in the Sun, and their control over the natural world as descendants from the most powerful deity. 1. Pedro Cieza de León, The Discovery and Conquest of Peru: Chronicles of the New World Encounter, ed. and trans. Alexandra Parma Cook and Noble David Cook (Durham and London: Duke University Press, 1998), 316–19. Cite this page as: Dr. Emily Engel, "Maize cobs," in Smarthistory, August 9, 2015, accessed April 23, 2019, https://smarthistory.org/maize-cobs/.